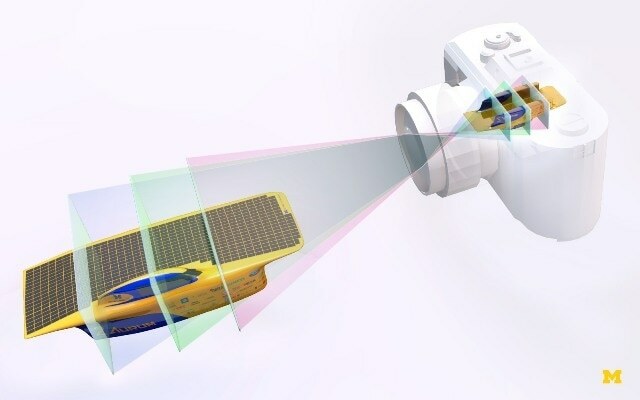 A camera that can record 3D images and video is under development at the University of Michigan, with $1.2 million in funding from the W.M. Keck Foundation. "When the light hits the detector inside a camera, it can come from different directions, and this spatial information can be used to reconstruct 3D images," said Zhaohui Zhong, an associate professor of electrical engineering and computer science. "Normally, that information is lost because the detector only measures intensity," he added, which is why 3D images made with traditional recording methods must be constructed from multiple shots. One-shot 3D cameras available now rely on a micro-lens array to divert the light after it has been focused by the main lens. This array of smaller lenses essentially tears up the picture to recover the directional information from the rays of light, and then the camera's software reconstructs the image along with the depth information. "The microlens approach involves an inherent trade-off between resolution and the ability to refocus or resolve depth," Norris said. "Our stack approach enables more information to be acquired without losing image resolution." "Ordinarily, you want the light detector to absorb as much light as possible for high sensitivity, to produce a clearer picture," Zhong said. "Graphene detectors can offer very high sensitivity, so you don't really sacrifice the clarity by making them transparent." Norris is also a professor of applied physics. Fessler is also a professor of applied physics, biomedical engineering and radiology.